“Our Feet Rise and Fall Together”, that was the theme for the Special Olympics USA Games Seattle, 2018. The first week of July 2018, was the best EVER! Our daughter Chloe has been participating in Special Olympics sports since she was 9 –gymnastics, softball, swimming, bowling and now bocce ball. Chloe did well at the Special Olympics state level and was invited to apply for theUSA Games –Special Olympics national level. Chloe passed the interview process and had glowing recommendations from coaches, staff and friends! There were several meetings at Special Olympics MN offices in Minneapolis to plan, rally and get fitted for uniforms. Athletes received their duffel bags and all the sports regalia it would take for the whole week in Seattle. The Mission: “The 2018 Special Olympics USA Games will showcase the abilities of athletes with intellectual disabilities, promote the ideals of acceptance and inclusion through sport and celebrate the transformative power of special Olympics”. 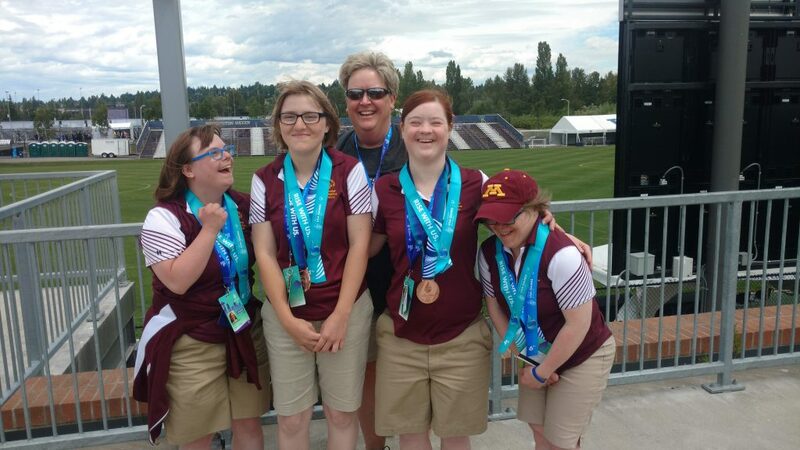 Chloe’s Minnesota state bocce ball team practiced together for months and were ready to go June30! The entire Minnesota team (83 athletes, coaches and unified team partners from several different sports) traveled together on a chartered flight from Minneapolis to Seattle. They got to stay in the dorms at University of Washington Seattle. It was so well planned, organized and supported! What a wonderful way to spend a week in a community of inclusivity, respect and sportsmanship. Our family traveled to Seattle to be at the opening ceremonies (also broadcasted on ABC television) and watch Chloe play bocce ball in individual, doubles and team levels. She played every day, Monday through Thursday. There were some real nail biter matches, and during all of it-respect and great gamesmanship. The awards ceremony for bocce ball was on Friday July 6 (see the picture of Chloe(far left), her coach and team mates). It was a very moving event with great new friends, great grace and excitement! Medals, ribbons and pins were eagerly received and shared! What an opportunity for our daughter and for us!